The members of our board formed Renew American Prosperity to generate and distribute support to organizations and individuals working to rebuild a sustainable American economy. We’re looking for people who ensure, gather and publicize information about the real costs of fossil fuel and extractive and polluting industries, as well as their various spokespeople, allies, activities, and policy impacts on Americans. We think there has to be more accountability than there is right now. If you do as well, please contact us. Just click on the button below if you are interested in helping us support those leading our nation toward a sustainable economy. As a Renew American Prosperity donor, you are choosing to help check the influence of the polluter lobby and corrupt officials in government. We encourage you to be public about your identity as a donor. We’re proud to have the support of such notable funders as philanthropist Lucy Rockefeller Waletzky, legendary entrepreneur Brad Mattson of Siva Power, Silicon Valley attorney Mike Danaher, and communicator extraordinaire Matthew Lewis. Should you want to keep your support for Renew American Prosperity private, as do others, we also welcome your donations. Private donor support will remain strictly private, out of respect for 501(c)4 tax law that allows donors who wish to be private to remain so. We will never sell or make available to other organizations our supporter lists. As financial support for an advocacy organization, donations to Renew American Prosperity are not subject to state or federal campaign finance source restrictions or contribution limits. Accordingly, donations to Renew American Prosperity are accepted in any amount from individuals, corporations, labor organizations and tribes. Each year, Renew American Prosperity is required to provide certain financial information to the Internal Revenue Service about its donations and expenditures. However, under current law, specific information on Renew American Prosperity’s donors is not publicly disclosed. If you’re interested in learning more about donating or our donor policies, contact us at renewamericanprosperity@gmail.com. 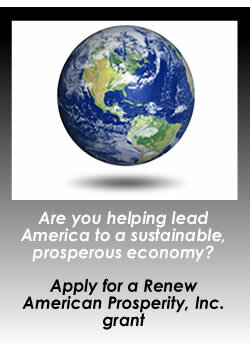 Contributions to Renew American Prosperity are not tax-deductible.